Solve Visual Pun Riddles. Play PunPics. Can you guess the visual pun? 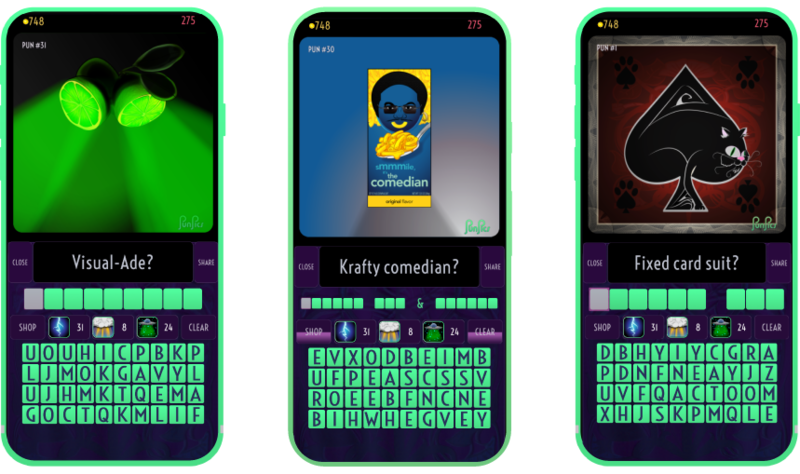 PunPics is a growing collection of visual, word puzzles. Think creatively to figure out each pun-infused solution. Free on the App Store and Google Play. Humor, puns, riddles, lateral thinking, rebus puzzles, mind benders, brain teasers–PunPics has it all. That face on your head will smile while you revel in the splendor of PunPics' visual puzzles and sense of humor. Players report experiencing smiles, laughter, and a range of other emotions while playing PunPics. Disgust was one of them (see following rule). That was possibly caused by pun #39. Or pun #24. Or #37. Maybe even #48. Look, the other reviews are pretty good. The point is people FEEL when they play PunPics. Isn't that what this crazy existence is all about anyway? Like...feelings and stuff? Get outta here, babies! That's right. PunPics is intended for mature audiences. Use your fully developed fingers to download and play PunPics today. PunPics artists create new visual puns for all to enjoy. You are sure to find something irrelevant, pleasing, or distasteful when you play PunPics.